Not your typical winter colors, love it! Thank you! An amazing array of different layouts from this one kit! Nice job Marisa and creators! Such a beautiful kit for a long Minnesota winter - thank you! Thank you so much!! This bundle is wonderful, love the glitter and the fun vibrant colors!! Absolutely love this, all the glitter is terrific, thanks again Marisa! Lovely colors, Thank for sharing! Love the colors and glitters and snowflakes! Thank you. I love the sparkle! Thanks! Thank you for this bundle I love the colors in it. Really great colors, so unique! Thank you! An absolutely beautiful kit. Thank you. So pretty! And such an original colour scheme for Christmas, too! this is gorgeous! love the glitter! Have to have this - how do I purchase it? Just love this!.... the colour palette, sparkle... everything! I've got to have it! ...but how????? I love all the sparkle and glitter in this kit! Plus, the palette is just fabulous ... very stunning and dramatic! Thank you for your gorgeous work! this is really beautiful! I love it!!!!! Oh I want this... don't know how though??? Love the kit. Not sure how to get it though. 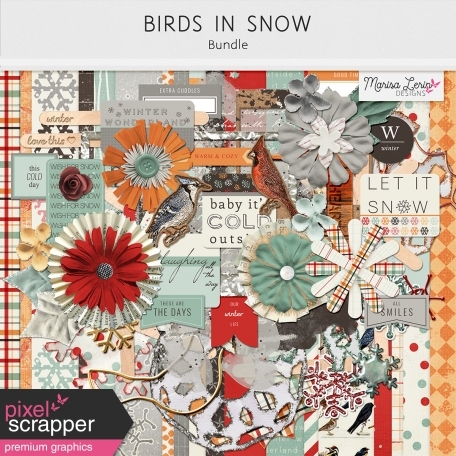 This bundle contains the Birds in Snow papers, elements, alpha and glitter styles.